The domestic cat is a carnivorous mammal of the family Felidae. The word comes from the low Latin cattus (wild cat). That word may come from the verb cattare would mean stalk. As we see this cat was considered a hunter stalking his prey. 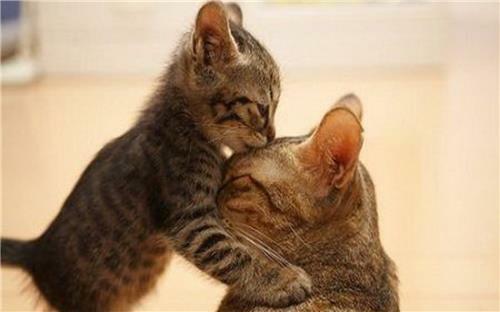 I love you Mommy – aaaw cute! The domestic cat Felis silvestris catus is very close to the European wildcat (Felis silvestris silvestris) and African wild cat (Felis silvestris libyca). According to most contemporary zoologists, these three types of cats forming a single species: Felis silvestris . A breed of cat can be natural as with the Siamese breed, or may have been created by man crossing different cats until the desired physical attributes occur, as in the case of Ragdoll, or may even come from crosses between wild cats and household cats. The latter case eg Bengali cats, and are called hybrid races. The first inventory of cat breeds was conducted by the Swedish physician and naturalist Carl Linnaeus in the book “Systema Naturae” in the eighteenth century. There cats were divided into four major races: the domestic cat (catus domesticus), the Angora cat (angorensis Catus), the Spanish cat (hispanicus Catus) and Chartreux cat (Catus coeruleus).